June 13, 2018 – Zili Wu of the Department of Energy’s Oak Ridge National Laboratory grew up on a farm in China’s heartland. He chose to leave it to catalyze a career in chemistry. 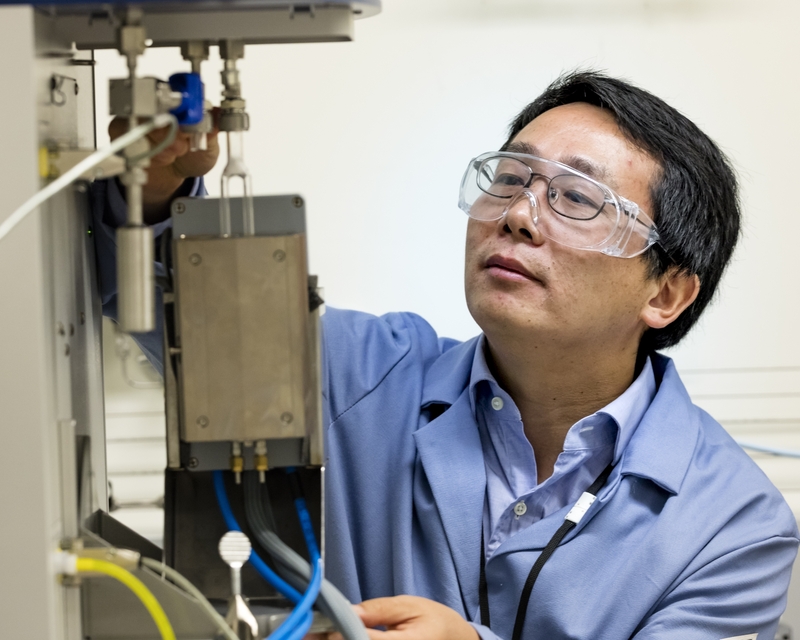 Today Wu leads ORNL’s Surface Chemistry and Catalysis group and conducts research at the Center for Nanophase Materials Sciences, a DOE Office of Science User Facility at ORNL. It turns out what he learned on the farm would later continue to inspire him and feed his accomplishments. In the 1990s at Wuhan University, a professor captivated Wu with the idea that biochemistry was at the center of two disciplines, with a lot of interaction between the two. “That’s where a lot of interesting things happen,” Wu enthused. Summer jobs at Wuhan gave Wu his first taste of catalysis research. Chemical reactions follow different pathways to yield diverse products, not all of which are useful. Catalysts lower the energy required for activation of select reaction pathways. Because they increase chemical yields of desired products, they save energy and reduce waste. For his graduate studies, Wu attended Dalian Institute of Chemical Physics, working with luminary chemists Qin Xin and Can Li. Wu found photocatalysis pioneer Li an especially inspiring role model. Li arrived in the lab at 8 am, left at midnight and held meetings on weekends so all members of his large group could attend and learn from each other. Like most students in China, Wu had studied written English but had little opportunity to speak it. During graduate school, he spent a year in Spain working with English-speaking colleagues. Back at Dalian, a visiting professor, Peter Stair, came to rely on Wu’s English skills. Impressed by Wu’s chemical prowess as well, Stair offered him a postdoctoral fellowship in the catalysis center he directed at Northwestern University. Wu earned his doctorate in 2001 from Dalian. In 2003, he left for Northwestern to work on an ultraviolet Raman spectroscopy project for chemical firm Johnson Matthey to understand catalyst deactivation. In 2006, Wu joined ORNL and devoted himself to research to understand complex catalysts and reactions, using applied spectroscopy and well-structured nanomaterials. Much high-impact research ensued, as exemplified by a paper published in 2012 on which he was the first author. To this day it remains a top 1 percent-ranked paper in the catalysis field. Wu’s many projects aim to design ideal catalysts. His primary tool, spectroscopy, connects them all. Wu monitors catalysts and their intermediates and products with operando spectroscopy—which employs optical spectroscopy (infrared and Raman), neutron and X-ray spectroscopy, in situ electron microscopy and other techniques (mass spectrometry and gas chromatography)—to make real-time measurements of catalysts working under reaction conditions in an environmental cell. One of Wu’s projects controls the morphology of nanocatalysts that expose different crystal facets to change interactions with reactants. “With a different shape, you can expose the structure of the atoms differently,” Wu explained. “You can get different directivity or selectivity, even different electronics because of surface structure effects. You can completely change the reactivity of the atoms with the catalyst when the catalyst is shaped differently.” For example, Wu studied ceria catalysts and provided a deep understanding of why shape matters in guiding reactants to specific products. In another study, Wu helped show inexpensive common metals have the potential to replace expensive noble metals, such as platinum and palladium, in commercial catalysts. If theory predicts a catalyst will work well, ORNL’s Sheng Dai, an expert in the precise synthesis of materials, can make it and Wu can test it. Dai made a “CCC catalyst”—an oxide compound made with copper, cobalt and ceria. Wu characterized it, and ORNL’s Todd Toops at the National Transportation Research Center performed tests that showed it usually worked better than a commercial catalyst at removing carbon monoxide, nitric oxide and hydrocarbons from automotive exhaust. A catalyst can deactivate when a chemical reacts strongly with it, blocking active sites, or through chemical poisoning. The latter is the focus of Wu’s work in the Center for Understanding and Control of Acid Gas-Induced Evolution of Materials for Energy, a DOE Energy Frontier Research Center headquartered at Georgia Tech. Industrial processing removes organic sulfur from raw oil because corrosive sulfur gas, generated when the fuel is burned, inactivates an important catalyst. Wu’s in situ characterization reveals exactly how acidic gas enters the catalyst, reacts with it and changes its structure. Having grown up on a farm, Wu knows a thing or two about plants. Now he wants to beat plants at a small but critical step of photosynthesis—splitting water into hydrogen and oxygen—and thinks catalysts can help. The challenge is getting the hydrogen out of the water in the first place. Applying an electric charge can split water and make hydrogen. Sunlight can also split water if a catalyst is present to absorb its radiant energy and generate a charge. “My dream is to efficiently convert solar energy into chemical energy,” Wu said. Aided by enzymes, plants do exactly that, albeit inefficiently. They convert less than one percent of the solar energy they capture into chemical energy. “To do better, we need catalysts,” Wu said. Exploring two-dimensional materials, he and colleagues at the CNMS discovered synthetic catalysts that can outperform photosynthetic enzymes at using light to accelerate a chemical reaction—called photocatalysis. Wu will build on such advances by pooling resources in imaging, theory and supercomputing to gain insights about experimental observations. He hopes to use this knowledge to design “ideal” catalysts that are nearly 100 percent efficient at converting reactants to a selected product. Ideal catalysts could accelerate the advent of energy-efficient production of fuels, pharmaceuticals, polymers and other commodities that would not be profitable or possible without catalysts. DOE’s Office of Science supports Wu’s research.